INDIANAPOLIS -- Police are searching for a possible serial robber armed with an Uzi-type weapon. Indianapolis Metropolitan Police Department investigators say on August 28, a man forced a clerk to the counter at the Village Pantry on 86th Street near Ditch Road and demanded money and Newport cigarettes. Police say the suspect was armed with an Uzi-type and placed the stolen items into a black backpack he brought with him. The clerk was not injured during the robbery. 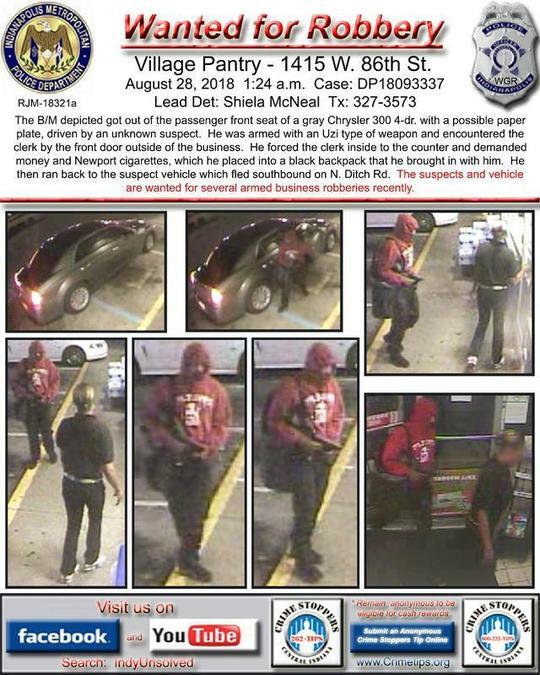 Police say the same suspect and vehicle are possibly connected to several armed robberies at businesses in the city. If you have any information on this crime or recognize the suspect, contact Crime Stoppers of Central Indiana at 317-262-8477.